Being accused of domestic violence in the state of California is a serious charge. Even if you are innocent, you must take your arrest seriously. Under California law, police are nearly always required to arrest any man or woman accused of spousal abuse or domestic violence—whether or not the suspect is guilty. A person who receives a misdemeanor conviction for spousal abuse could end up spending up to one year in the county jailhouse. A person with a felony conviction for domestic violence could end up spending at least two years in prison. Recent laws that are meant to protect domestic violence victims can often end up victimizing innocent people that are wrongfully accused of committing domestic violence crimes. District attorneys will frequently pursue a case of spousal abuse even after a police officer admits to exaggerating any complaints or after an alleged victim confesses that he or she lied about being abused. D.A. 's frequently believe that the alleged domestic violence victim is just trying to prevent their abuser from spending time in prison or acquiring a criminal record. 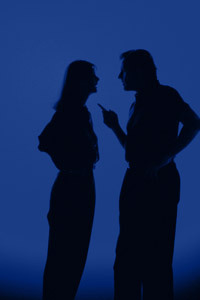 If you have been arrested for spousal abuse or another charge that is related to domestic violence, including making criminal threats to your spouse or partner, battery, assault, damaging the phone lines of your spouse or partner, making threatening phone calls, or intimidating a victim or witness, you must call a criminal defense lawyer who has the experience to defend you. Frequently, domestic violence charges can be lowered or dismissed so that you don't have to serve any jail time. The Law Offices of David M. Boertje knows that the criminal justice system operates in the accuser's favor. We will aggressively handle your case and do our best to make sure that justice is on your side. To speak directly to a criminal lawyer and for answers to questions related to your domestic violence case, or any other kind of criminal case, please call us today for your FREE CONSULTATION. You can also fill out the form on our Contact Us page or write us via e-mail. We will get back to you as soon as possible.